In the last decade gin has experienced a striking renaissance, with the growth of small-batch distilling and the revival of Thirties couture, décor and drinks. But the history of this potent, elusive liquor runs far deeper than passing fashion. Beginning in the alchemical laboratories of medieval Europe, this books follows the adventures of gin over four dark, decadent centuries of consumption and excess. From the tyranny of ‘Madam Geneva’ to the doomed romance of Casablanca, this is a cultural history with a twist – an unforgettable voyage into the anatomy of pleasure and pain. 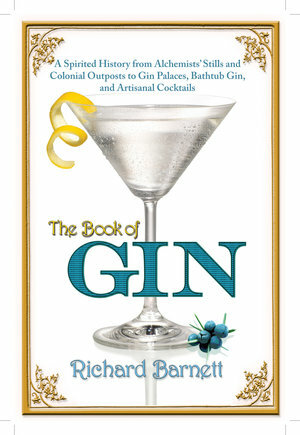 You can read buy a copy of The Dedalus Book of Gin on Amazon here. The Dedalus Book of Gin is published in the US by Grove Atlantic, and in a rather gorgeous Russian edition by New Literary Review. Audible are making it into an audiobook, release date TBC. I lead a popular guided walk around the landscape of the London Gin Craze – do drop me a line at richard [at] richardbarnettwriter [dot] com if you’d like to arrange one. The paperback edition, released in Feb 2016, was Nicholas Lezard’s choice in the Guardian.